The Rotate tool is used to “gate” a selected shape around a point along curved paths. 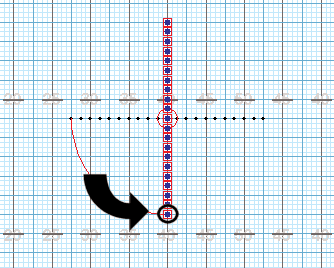 To establish the counts where the rotate transition is to begin and end in the drill, set the Red Anchor on the Count Track to the count where the rotation is to end. This is typically the count of the set you are currently working on. Set the Yellow Anchor to the count where the rotation is to begin. This is typically the previous set. After selecting the shape or shapes that you want to rotate, clicking on the Rotate tool will display the Rotate Tool Control Panel. Editing Handles appear on each selected performer. These handles can be dragged and thus rotating all performers to the final location of the rotation transition. While dragging the editing handles the location of the cursor is displayed in the Console as well as the Largest Stride and Largest Distance. 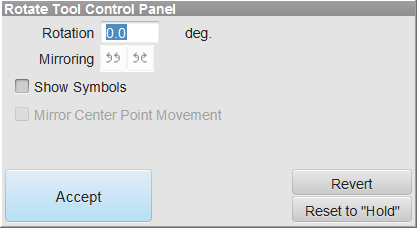 The Rotation Control Panel also displays the angle of rotation. A Point of Rotation handle will appear in the center of the selected performers. The Point of Rotation can be changed by dragging this handle to a preferred location. Entering an angle in the Rotation text box will move the editing handles to reflect the angle entered. Mirroring Options are available if two or more shapes are selected. When mirroring, the rotation of the shapes can be set to rotate on each shape’s individual point of rotation. The rotation can be in the same or opposite directions. Reset to Hold – resets the transition to a “hold” from the secondary count.